Lullingstone is the site of one of the earliest known Christian chapels in the British Isles, dating from the 4th century. The mosaics and wall paintings have been well-preserved, offering an understanding of the symbolic nature of early Christian worship. 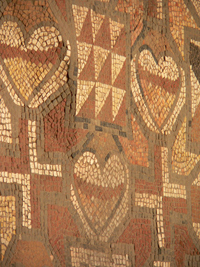 Mosaic from Lullingstone Villa, from Art in the Christian Tradition, a project of the Vanderbilt Divinity Library, Nashville, TN. http://diglib.library.vanderbilt.edu/act-imagelink.pl?RC=54395 [retrieved April 24, 2019]. Original source: http://www.flickr.com/photos/mharrsch/135554275/.